Chelsea explained that the Intervale Center has many opportunities for volunteers that wish to get their hands in the soil and help with the mission. In 1986, Will Raap, founder of Gardener’s Supply Company, spearheaded an Intervale clean-up effort to restore the Intervale – 700 acres of bottomland within the city limits of Burlington, Vermont – to its agricultural roots and feed Burlington. Thanks to more than 20 years of extraordinary work by the Intervale Center (initially named the Intervale Foundation) and those who farm here, the Intervale has been transformed into a nationally recognized center for sustainable agriculture. In the 1980s, the Intervale was a dangerous and unwelcoming place for visitors. Agricultural fields had been abandoned, and people were using the Intervale as an informal dumping ground for tires, furniture and other garbage. Will Raap and many other dedicated community members removed garbage and debris, rebuilt depleted soils through composting and started gardening and farming, and through their actions, began to transform the Intervale from an informal dump to a beautiful agricultural and recreational resource for Burlington. Today, visitors find in the Intervale a unique and innovative community built around growing, eating and celebrating locally grown food. 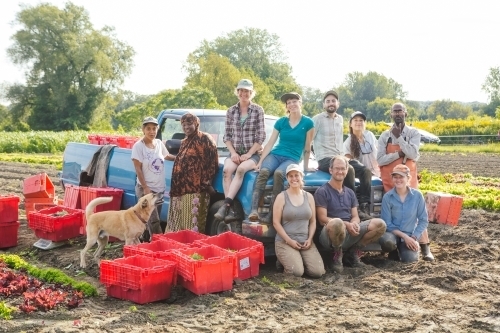 At the Intervale Center, they find a mature nonprofit organization dedicated to strengthening community food systems by enhancing farm viability, promoting the sustainable use of agricultural lands and engaging people in the food system.